Dissonant, post-modern death metal is hardly a new manifestation in the field, but to this date there are still only a handful of bands birthed in each generation that manage to pull it off with style, and Australians Altars are about to join that limited roster with the release of their full-length debut Paramnesia through Nuclear Winter Records. This is a record that will invite immediate comparisons to the band's more unusual countrymen, Portal, or their offshoot Impetuous Ritual, but they don't play with quite the same level of impenetrable grime and sleaze. 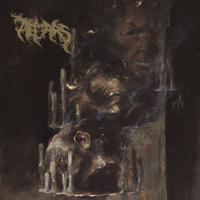 This is an easier puzzle to piece together, with a more accessible, if still murky production, and some churning, primordial callbacks to the sounds of surreal black metallers Deathspell Omega or Dodecahedron, maybe even some riffing constructs redolent of Morbid Angel, Gorguts, and Incantation.